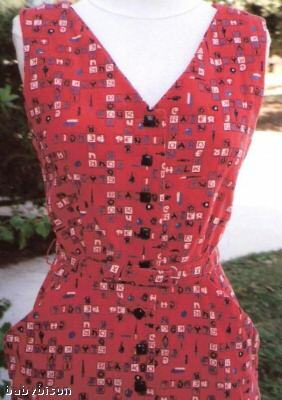 Hélose sent me a link to this eBay auction — the picture is not of the best, but really, do you need to know any more than "1950's crossword-themed dress?" before you start mousing around for the "Bid" button? It's 36-26(ulp)-39, and the bidding right now is about $25. As you know, I already am the proud possessor of a crossword-themed dress, but I'm keeping an eye out for more crossword fabric — the tournament does last three days, after all. I can't tell if the buttons are little squares or not, but it looks as if they are. And it has pockets, to hold your pencils! What more could you ask? Click on the image to visit the auction, as usual. Has anyone ever seen Scrabble-themed clothing or fabric? Fun! Who would have thought “wiggle dress” and “crossword theme” could occur in the same heading?! Erin, did you ever see the Threads article where the three seamstresses were supposed to imagine they were going to a Scrabble thing and had to make an outfit to match that could also be changed into an evening outfit? hard to explain, but it is in a back issue of Threads magazine and might give you some sewing ideas. i believe they are square buttons. I’m sure you saw this scrabble theme fabric bag?http://mysite.verizon.net/kevanddi/index.htmlMaybe the bag manufacturers would divulge their fabric source if you asked nicely! My ds has a scrabble-themed tie. Looks just like the board with some tiles on it.